Katharine Hepburn was never a fan of the Academy Awards. In her eyes, awards meant nothing. "My prize is my work" Hepburn once said. Despite this aversion to film's night of nights, she still remains the actor who has won the most Academy Awards to date by winning four golden statues from her twelve nominations. Hepburn never once turned up to accept any of her awards. In fact, the only time Hepburn ever appeared at the Academy Awards was in 1974 to present the Irving G. Thalberg Memorial award to Lawrence Weingarten. Hepburn's Oscar wins are a representative of her truly incredible career. She won her first award in 1934 and her final in 1981, nearly 50 years after she won her first. With a background in theatre, her film career spanned over 60 years and despite being labelled box-office poison early in her career, is remembered for her strong female characters and incredible versatility. It only takes a look at the roles in which Hepburn was nominated for and won in order to understand why she is considered one of the greatest or many will argue that she is in fact the greatest film actress to have lived. Her versatility and passion for the fascinating and strong characters which she wholly committed to remains an inspiration for many actors even today who still admire her as an actress and an incredibly strong woman. As it is 108 years to the day that Hepburn was born in Hartford, Connecticut, let's take a look at what the Academy recognised as Hepburn's twelve greatest roles. Katharine Hepburn won her first Oscar with her very first nomination at the sixth Academy Awards. In Morning Glory (1934), she played Eva Lovelace, a young woman with stars in her eyes who desires to become a Broadway actress. This was only Hepburn's third film and was a role she could relate to having come from a theatre background herself. However, as she so often exemplified, being that she could relate to the film wasn't an excuse for not putting her all into the performance. As would become tradition, Hepburn was not there to accept the award. Even though Hepburn was considered box-office poison during the years 1934-1938, this wasn't reflected in the calibre of her performances during this time. Despite being considered an untrustworthy investment in these years, the Academy still acknowledged her performance in Alice Adams in 1936 and she was nominated for a second time. In this George Stevens directed film, Hepburn played the title character who is a young woman trying to climb the social ladder and will go to extreme measures to make sure her façade is not uncovered. The Philadelphia Story is regarded as the film that marked the end of Katharine Hepburn's label as box-office poison and Hepburn herself said that it was Tracy Lord who gave her her career back. The Broadway play was written by Philip Barry especially for Hepburn and she backed and performed socialite Tracy Lord. Howard Hughes bought the screen rights as a present for Hepburn and she reprised her role on screen, in what was both a critical and financial success. Woman of the Year is remembered more often that not as being the first pairing between Katharine Hepburn and Spencer Tracy. It was a union which was repeated in eight films after this and symbolised the beginning of the great love affair between Hepburn and Tracy. One cannot argue that acting opposite Tracy did wonderful things for Hepburn, as was shown here in Woman of the Year. Here she played a political journalist who falls in love with a sports writer (Tracy) who works for the same newspaper. The chemistry between the two is unmistakable, but Hepburn's performance of the strong female character would not feel lost in a film in the 2000's. John Huston's film The African Queen is regarded as a timeless classic in which both Hepburn and Humphrey Bogart were nominated for Academy Awards. Hepburn, once again showing her versatility, played a religious spinster who is accompanied up the African river by sea captain (Bogart). The stories which were told of the time in Africa by Hepburn and close friend, Lauren Bacall became legendary, as has the film itself. This was Humphrey Bogart's only Academy Award win and Hepburn's fifth nomination. Summertime marked Katharine Hepburn's sixth Oscar nomination. The film, which was directed by David Lean, saw Hepburn portray a secretary who has resigned herself to living a lonely life and travels to Venice, Italy where she unexpectedly finds love. The film showed Hepburn in a vulnerable, but romantic light and this was a side to her acting that was celebrated by fans and critics alike. After being nominated a year before for Summertime, her nomination for The Rainmaker the year after was her first time receiving two nominations in consecutive years. As "plain" girl in town Lizzie Curry who cannot seem to find a man until a drought brings Bill Starbuck to her life, Hepburn was endearing and incredibly likable. Suddenly, Last Summer saw a different pace for Katharine Hepburn. She was honoured with her eighth nomination for her role as Violet Venable, the grieving mother who is now responsible for looking after her mentally unstable niece (played by Elizabeth Taylor). In this psychological thriller/ drama, Hepburn gave an extremely strong performance of a mother who could be quite terrifying and disturbing. Katharine Hepburn continued her nominations with the role of another mother with a harder edge in Long Day's Journey Into Night. The film, which was originally written as a play, was Eugene O' Neill's autobiographical work and Hepburn portrayed the drug dependant mother in a stirring, unsettling and very powerful role. Hepburn's nomination was the only Oscar nomination which the film received and the final time she would be nominated without winning. Guess Who's Coming To Dinner gave Hepburn her long-awaited (but not by her) second Academy Award. 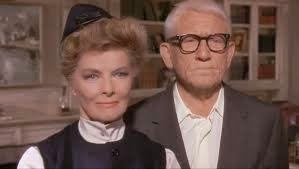 The incredibly moving, yet still comical film saw Hepburn and Spencer Tracy pair up for the last time and play parents of a girl (played by Hepburn's niece, Katharine Houghton) who brings home her African-American fiance for the first time. This film was incredibly bittersweet for her as it was no secret that Tracy was a very unwell man and passed away 17 days after filming wound up. Tracy was also nominated for an Academy Award and Hepburn never saw the finished film as it was too painful for her. Her good friend, George Cukor accepted the award on the night on her behalf. Katharine Hepburn won back-to-back Academy Awards when the year after Guess Who's Coming To Dinner she won for The Lion in Winter, which she tied with Barbra Streisand for Funny Girl. Hepburn played Eleanor of Aquitaine, an historical figure which she admitted to finding absolutely fascinating. 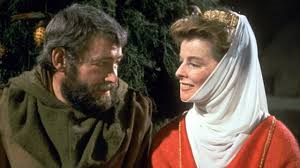 Playing one of the most outspoken and fiercely protective mothers in history, she gave a brilliant performance that was historically accurate of the queen as we know her and was a perfect match for Peter O'Toole's Henry II. The film's director, Anthony Harvey accepted the award on her behalf. With her final nomination nearly 50 years after her first, Katharine Hepburn won her fourth Academy Award at the 54th annual show. She was at her loveliest in the play turned film, On Golden Pond where she played wife and mother, Ethel. Hepburn played opposite both Henry Fonda and his daughter, Jane Fonda. 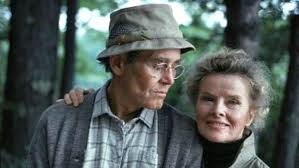 On Golden Pond is the only film to date in which both the lead actors who played husband and wife won Academy Awards, yet neither of them were there on the night to accept their awards. 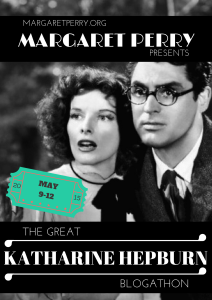 This post is part of the 2015 Great Katharine Hepburn Blogathon as hosted by Margaret Perry.